transcosmos’s eCommerce HUB is an integrated e-commerce platform that is filled with over 50 years of IT outsourcing operational excellence. 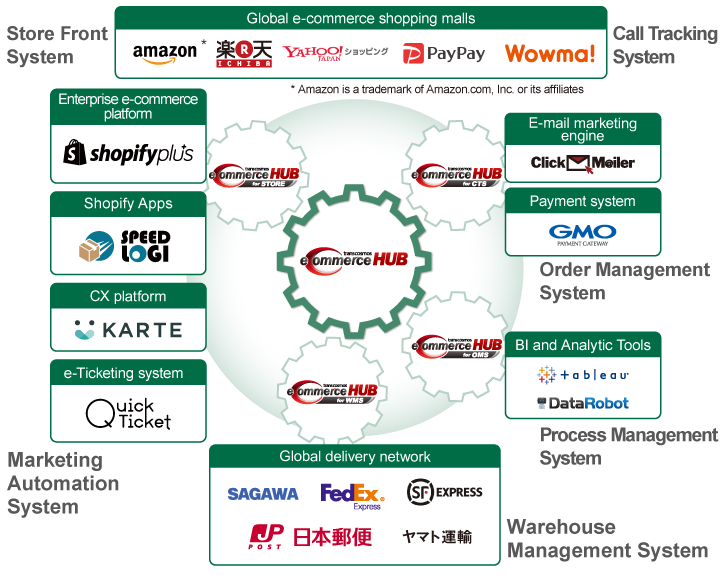 Seamlessly links the systems required for e-commerce business at real-time. Moreover, the platform satisfies clients’ diverse needs by closely integrating logistics, payment, advertising and all other essential services. NASDAQ listed PFSweb, the leading e-commerce one-stop services company in the United States, offers one-stop services ranging from developing e-commerce system to promotion, in addition to providing fulfillment and customer support services from its own warehouse and back-office support services including payment processing. In 2008, PFSweb formed a strategic solution partnership with Salesforce Commerce Cloud (formerly Demandware), and has a track record of providing services for over 40 companies in Europe and the United States. PFSweb also provides e-commerce solutions utilizing global standard e-commerce platforms, including Oracle Commerce, Magento, SAPhybris and IBM WebSphere Commerce. Salesforce Commerce Cloud is a world standard e-commerce platform which is used on more than 1,100 websites by 250 companies around the world, with a focus on retail businesses. Headquartered in San Diego, U.S., Digital Operative is a digital agency specializing in e-commerce. Digital Operative offers diverse services that include strategy & planning, content creation, e-commerce website development & operation, and digital marketing. Being a certified partner, Digital Operative excels in website development on these e-commerce platforms – “Shopify / Shopify Plus” and “Magento”. Digital Operative also offers content improvement services like A/B testing and conversion optimization solutions. Shopify plus is the enterprise solution of Shopify, the leading e-commerce website platform which caters to over 500,000 online stores whilst growing its popularity in the world. Recognized for its high design quality, Shopify plus is trusted by more than 2,500 emerging brands. VAIMO is an e-commerce support company specializing in e-commerce solutions development for the “Magento” e-commerce platform. Since its formation in 2008, the company has launched over 400 e-commerce websites. VAIMO has been awarded by Magento as the leading e-commerce solution partner in EMEA (Europe, the Middle East and Africa) region. In addition, it has sales and development bases in Sweden, the United Kingdom and South Africa. Utilizing development resources in Kiev (Ukraine) and Tallinn (Estonia), VAIMO develops about 100 websites annually for clients in Europe and the United States with over 150 developers. Used on 250,000 e-commerce websites around the world, Magento is the open source e-commerce website developing platform which owns the No.1 market share in the world with combining know-how and operational performance.